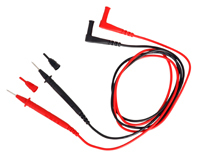 Unfused test leads with right angle 4mm plugs for use with most multimeters including the Martindale MM range. The probes are supplied with removable probe caps for GS38 compliance. If crocodile clips are required, the TL45 (unfused) or the TL55 with fuse protection are available.